While I was in town over in Chicago, I made plans with Andrew (one of my oldest and dearest friends -- since the third grade!) for dinner and drinks. Though I was very excited to have an opportunity to catch up with him (after playing a long game of meet-up tag during his visit back home to NYC/Tri-State area), I was really, really excited to be able to do so at The Aviary, the ever-elusive cocktail bar dreamed up by Chef Grant Achatz and Nick Kokonas of Alinea fame. Andrew had been before for a work-organized event, so I was happy to be going with a more seasoned patron. What had concerned me, however, was how difficult it actually was to get a reservation. I had no idea what that would be like, given that Aviary's website isn't too explicit on the process at the time, whereby the only information divulged was (1) that there are a limited amount of reservations daily at 6/8/10 PM; (2) that you can e-mail all reservation requests via e-mail; and (3) that there is a random selection process for reservations once requests are received. There was no indication on how far in advanced you could make reservations or when you would be notified of a confirmed reservation (the site still says that you'll be "contacted by 4 PM on the day of the reservation"). As you can gather, this made me really uneasy. So I figured I should just e-mail them and see what they say about my reservation request -- I really didn't have anything to lose by trying, especially since it was a little over a month before my visit. If anything, I'd be more informed on the process for next time. And I am really glad I did, too, seeing as I got a response a few hours later, saying that I had a table reserved on the night of Thursday, June 6 at 8:30 PM (huzzah!). A caveat is that all reservations have a fifteen-minute grace period (mine being 8:45 PM) before the table is released to those who may be in line. What a relief! Andrew and I arrived about fifteen minutes before our reservation, but we were seated shortly after we arrived. The entrance way lead through the standing lounge area which has a direct view of the cocktail laboratory (that's what I call it, at least) through a bird-caged wall (homage to its name) where the chef's kitchen table is located to serve a 10-course cocktail tasting menu (about $165 per person) for parties of two or four. 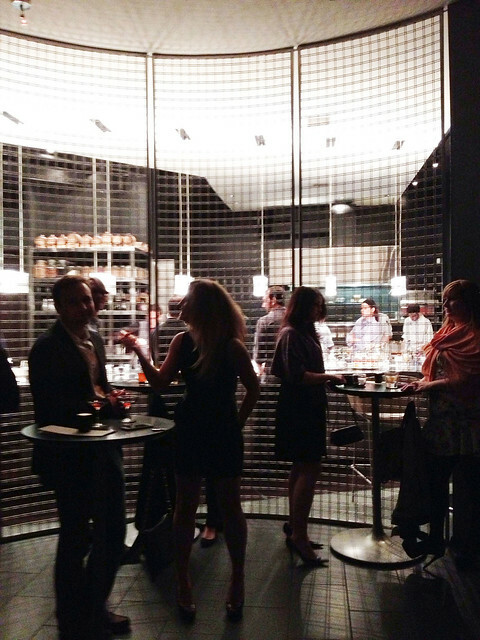 The Aviary aims to "give the same attention to detail to cocktails and service as a four-star restaurant would do its cuisine and experience." This is made possible because its bartenders are trained as chefs; the produce and herbs used are "carefully sourced and procured fresh daily"; the "name/branding of the spirit mixed is less important than its actual flavor"; and the drinks are "made quickly and consistently in a state-of-the-art drink kitchen in an environment which honors both innovation and traditions." 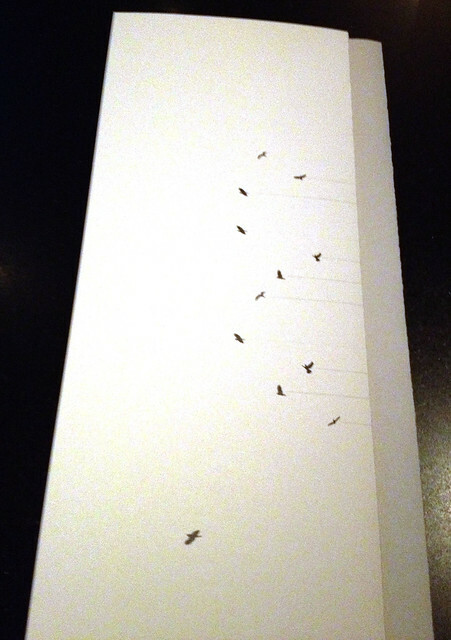 The menu cover at The Aviary, a subtle hat-tip to its moniker with different silhouettes of soaring birds. Menu contents that evening. Notice the description of spirits used are kept very general (pretty much to one word). The cocktail amuse given to us was a miniature slushie made using rhubarb, Aperol, and gin, resulting in a chilling, herbaceous, and sweetly fresh introduction to what was to come. As you will shortly come to see, The Aviary not only trains its bartenders as chefs, it even has a dedicated "ice chef" that creates all sorts of frozen goodies -- over twenty varieties/kinds -- to be stored in an exclusive ice room. Takes cocktail bar to a whole other level, for sure! 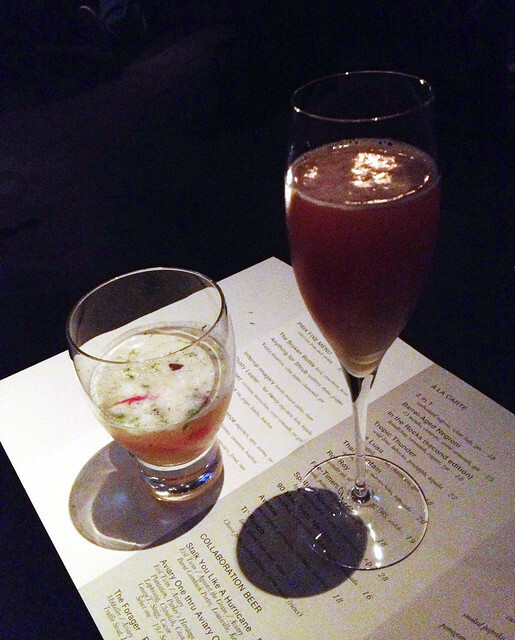 My first drink (left) was The Luau which was described as containing pineapple, matcha, chartreuse, and gin. The "science" behind it was actually green tea ice with micro-cilantro mixed in, all poured over with pineapple-infused gin and chartreuse. The pour-over resulted in the ice melting into the drink to the ideal temperature for enjoyment. It was unlike any gin drink I'd ever had -- it was like a little tropical party in my glass. Andrew had Avenue which had passionfruit sorbet, grenadine, calvados (an apple brandy), and bourbon -- essentially The Aviary's take on a bourbon sour. 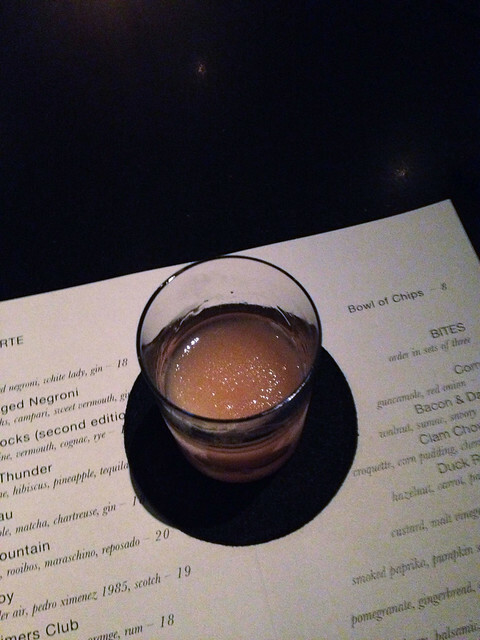 Anything mixed with bourbon is pretty much guaranteed to be a very strong, spiritful drink, and Avenue was no exception. But even with the sharp notes of bourbon, the drink is well-rounded out with a tangy sweetness from the passionfruit, grenadine, and apple brandy. A lovely sipping drink, indeed. The much anticipated cocktail for me, however, was my second one (which I also shared with Andrew) called Tropic Thunder which had wild lime, hibiscus, pineapple, and tequila infusing together in this beautiful apparatus, The Porthole. The beautiful infusion vessel was designed by Crucial Detail's Martin Kastner (the in-house serviceware designer of Alinea/Next/The Aviary) as a solution for "fast infusions" (i.e., "cocktails evolving during the course of time it takes to serve them"). Essentially, what The Aviary was looking for was "a window into another world, space, and time," and as such, for Mr. Kastner, the image of the submarine porthole in Karel Zeman's 1958 movie The Fabulous World of Jules Verne came to mind, inspiring the ultimate design direction. 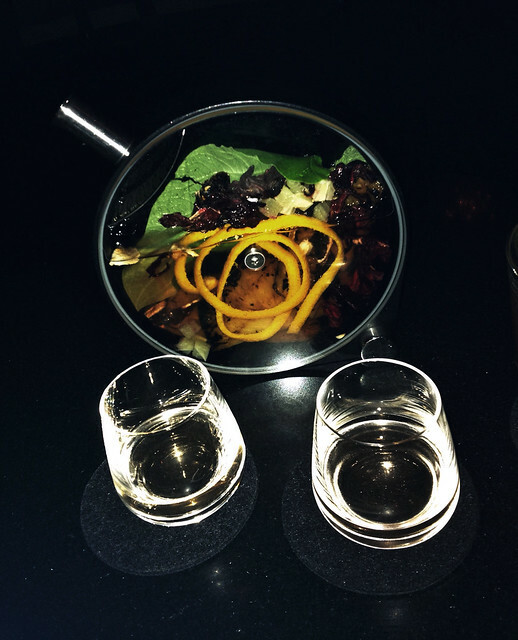 Additionally, the given cocktail that is infused and served using the Porthole at The Aviary changes every season -- Tropic Thunder was the vessel's current concoction. Initially, Tropic Thunder was very intensely carried by the intensity of tequila, but as time went on, the second pour was a more subdued, delicate, and thoroughly infused for a more relaxed beverage for the duration of the pours. Plus, the sheer aesthetic appeal was enough to awe and impress without even tasting a drop of what was contained. Now I know the next gadget I want in my kitchen, thanks to an incredibly successful Kickstarter campaign which raised a little over twenty-five times Mr. Kastner's fundraising goal! Andrew wanted to make sure I didn't miss one of the drinks on the menu, which was fittingly referred to as In the Rocks (second edition). What arrived was a solid orb of ice inside a rocks glass. Involved in this drink was another notably original gadget that needed to be used to put the finishing touches on the drink to become ready to be served. Attached to this circular metal ring was an elastic band spanning and stretched over its diameter with a cylindrical steel washer running through, emulating a contemporary slingshot. As it turns out, slingshot didn't deviate much from the intended use of this serviceware. As our server held down the metal ring over the drink's glass, she asked Andrew to pull the washer back (like a slingshot), aim at the center of the ice orb, and let go. The result is a broken orb of ice -- "a shattered ice balloon" -- from which contents of an Old Fashioned (in this case, the second edition contained benedictine, vermouth, cognac, and rye) spills into the glass, thus the name "In" the Rocks is quite appropriate. With this cocktail, you ultimately get an Old Fashioned, formerly in the rocks, now on the rocks. Strong and spiritous like Avenue, In the Rocks had an icy, more chilled temperature to it, adding another layer to be enjoyed upon sipping. If anything, this drink is certainly great for the theatrical aspect of it (who doesn't like the sound of elegantly broken of ice?) 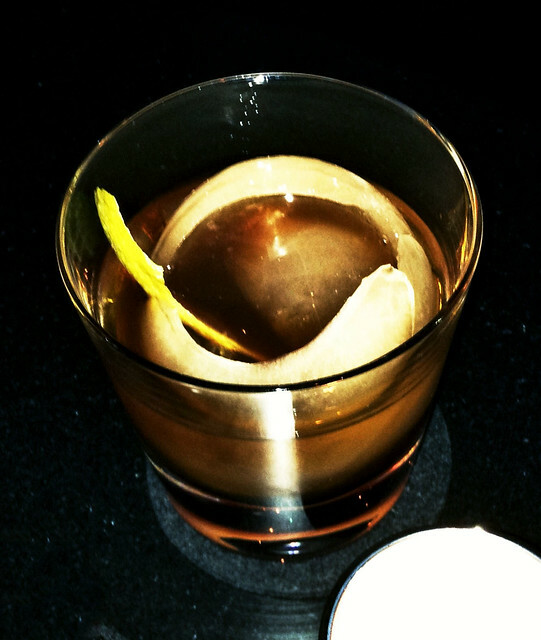 if you're already a lover of the Old Fashioned. Andrew and me enjoying our drinks at The Aviary. Findings: Just like how I felt with my visit to The Columbia Room in DC, my visit to The Aviary was nonpareil to any cocktail experience I've had before. 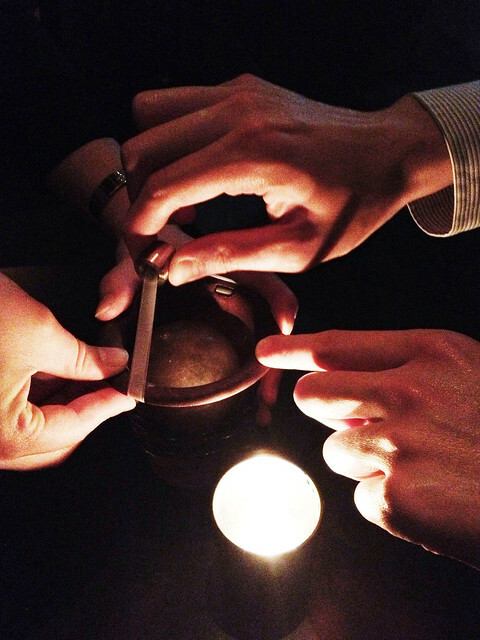 In the spirit of Alinea's constant push for innovation, The Aviary follows behind the same footsteps of its older sibling, only in the arena of crafted cocktails. The same attention to detail and composition is apparent in its offering of unique and unparalleled beverages, and the same minimalist, greyscale chromatics for the interior is done up, too. The gorgeous serviceware created by Martin Kastner of Crucial Detail is undoubtedly an important part of the awesome experience at The Aviary. Most notably for us was the Porthole, which captures the bold beauty of infused cocktails visually and its change over time. 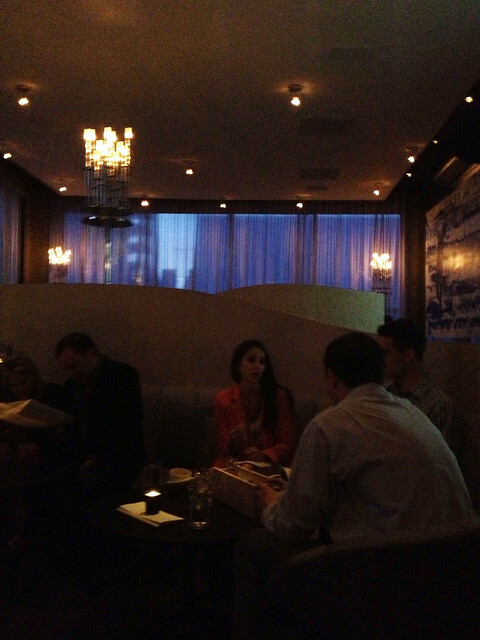 I'm more adventurous in atmospheres like this one -- here, I tried drinks that I wouldn't normally order at a more traditional cocktail bar (where I usually stay pretty close to my comfort zone and usual favorites), and I'm thankful for the courage that the menu at The Aviary inspires in me. I can gladly report that The Aviary is one of those places that can and will easily become part of the authentic Chicago experience for foodie and drink enthusiasts alike -- it really is unlike most cocktail bars and lounges that it'll leave quite an impression with you going forward. I know at least for me, this visit will go down as one of my top cocktail experiences I've ever had. Now, the key to getting into The Aviary is trying make reservations as early as you can -- a month or so in advance -- so that way your choice of date/time will have a better chance/flexibility to be more easily reserved. If time weren't a factor for my visit, I would've enjoyed a reservation for the 10-course cocktail pairing at the chef's kitchen table. Guess why there's always a next time in store! :) A visit to Chicago most certainly needs a detour here! 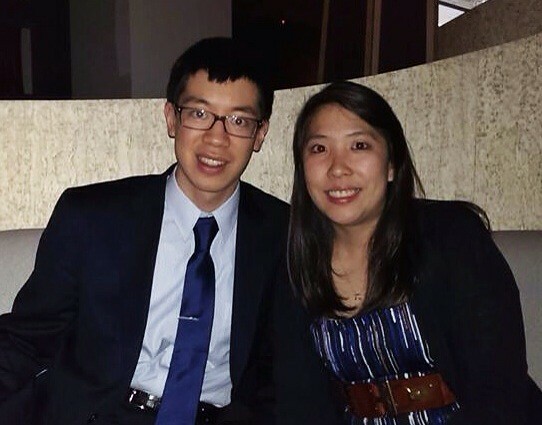 Thanks again to Andrew for being my partner in crime that evening -- so nice to catch up over these curiosity piquing drinks! 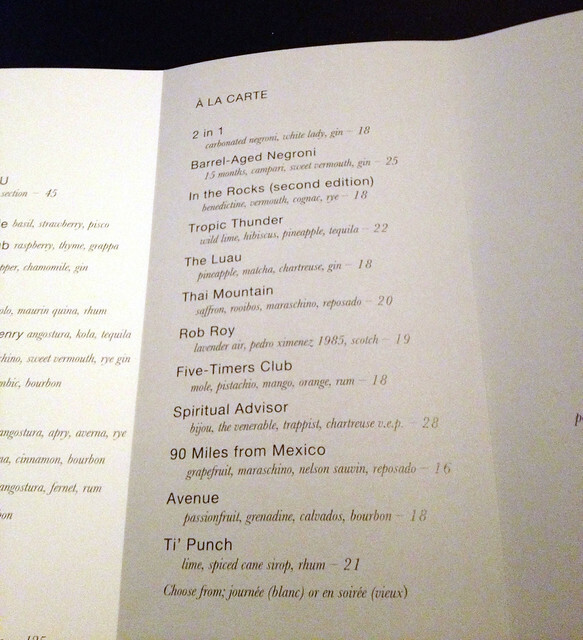 Price point: $18-22 for each a la carte cocktail. Drinks | Macao Trading Co.